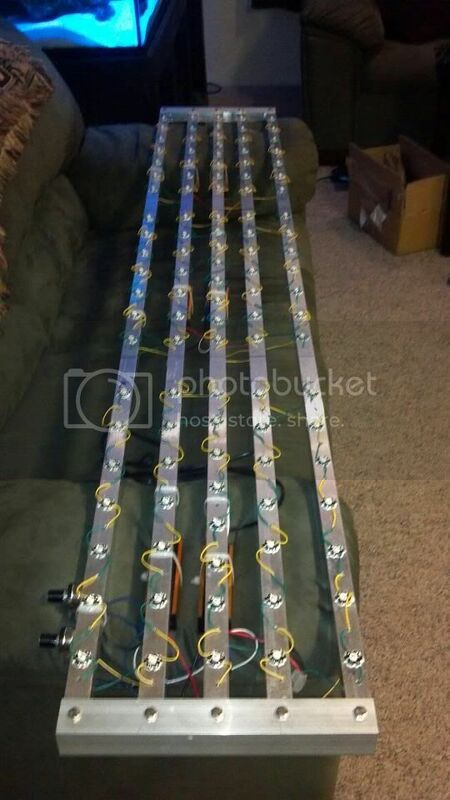 As a few of you know I ordered 108 3watt bridgelux Led's from aquastyleonline.com to replace the halides and ccompact florescents over my 125 gallon. I have all the Leds mounted onto the fixture and have the first series of 18royal blues powered up. I have 5 more series left to wire up. I was going to do more last night, but the miller lite wasn't helping out my wiring abilities after awhile I did however put the 18 leds that were lit up over my tank for a brief moment for comparison and they put my 175 watt halides to shame.. I am a little concerened that with the remaining 18 over that section if I were to put the reflectors on that I would most certainly cook the corals. The setup is dimmable, and the range is 100% to 40%. If anyone knows where I can get some sunglasses for my fish let me know.. I have a feeling they are going to need it!! Last edited by gammer_100 on Wed Mar 07, 2012 5:49 pm, edited 1 time in total. For anyone wondering the total fixture measures 72" x 12"
Both of these companies were great to do buisness with, and prices for both was unbeatable. updated pics from lastnight into this morning! Here's the light over my tank.. 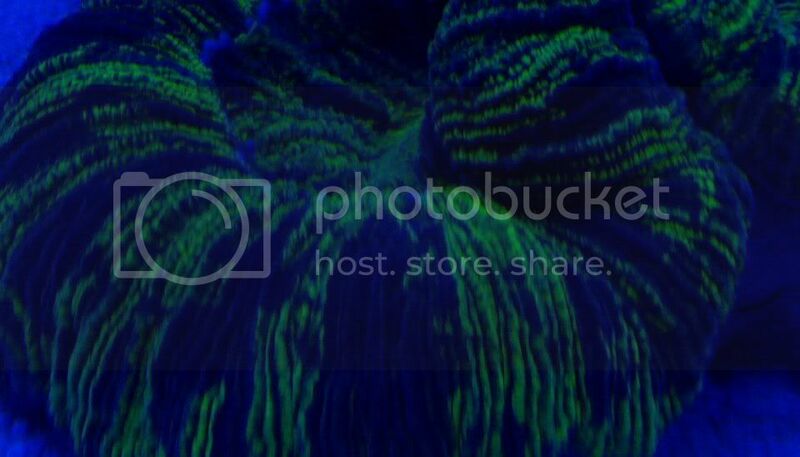 I wish that my phone could even pick up a hint of the corals' popping... because it is pretty intense. Looks awesome (and familiar !!! 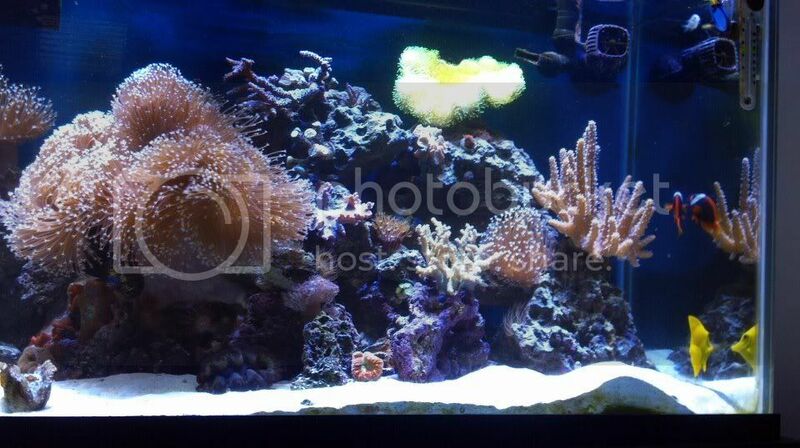 Yeah its crazy what the RB's do to corals, pics can't describe it. 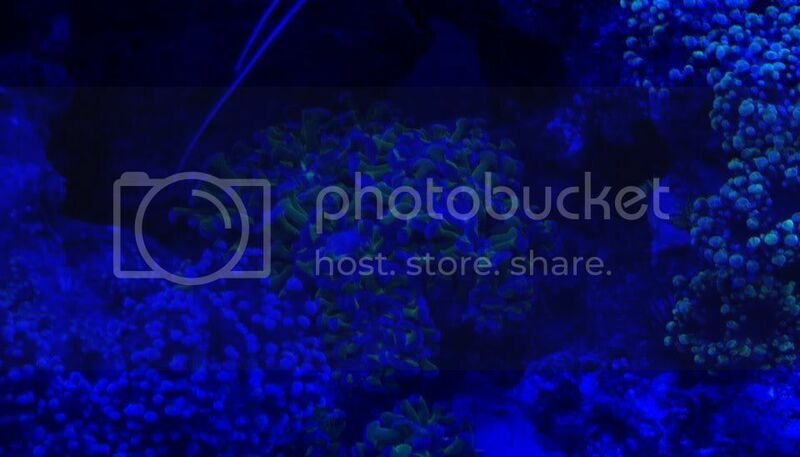 I started mine at 60% power and coral growth has been steady. It might be too bright as some are either just getting nice crisp new growth or bleaching slightly. I can't imagine them at 100% power! Didn't use optics and don't think I'll need to as I crank them up. That's sweet! 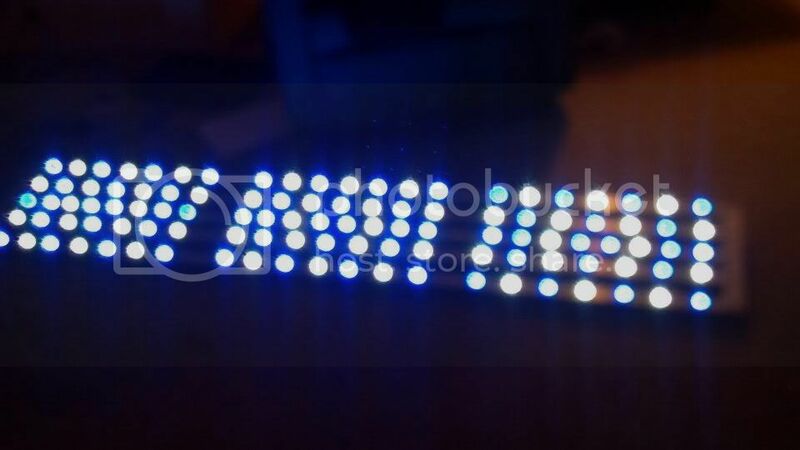 How many LED's would I need for my 20g Long tank? The lights have been up for almost 2 months.. and I love it!!!!!! Rather LOVE IT!!!!!! haha... 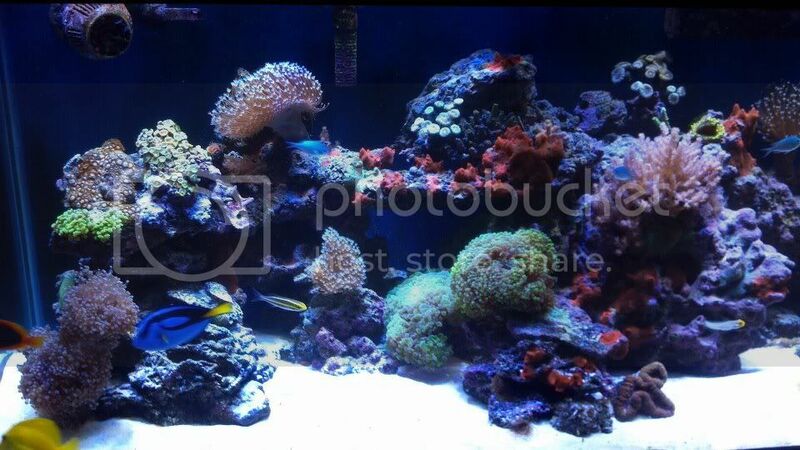 Here are some pics for you reef junkies! looks real good. love the build on wrs. tank lay out looks nice also. some big softies. 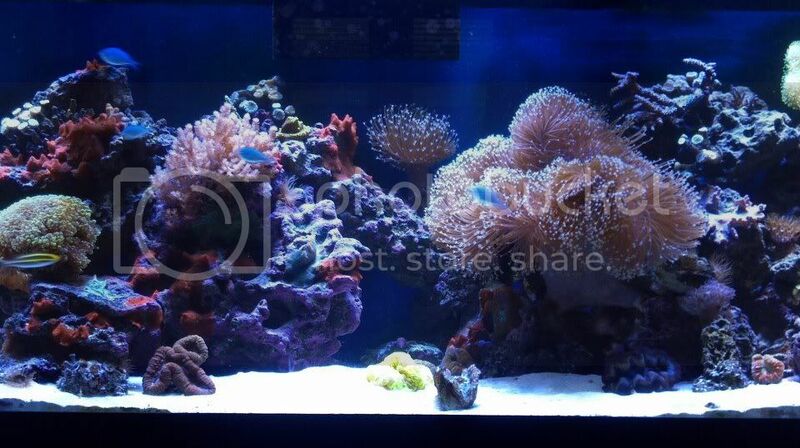 we went with 2 fixtures from john from fox valley reef for each of our 125s. hoping they will light it up as nice as yours does. did 2:1 ratio for 20k dimmable with 6 uvs in each. now we can compare lol.